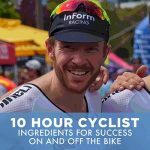 In this podcast Lee is speaking with a very well respected and well-known cycling personality here in Australia, Patrick (Pat) Lane. Pat has recently made some big decisions in his life, including his goals and ambitions for his cycling career moving forward. 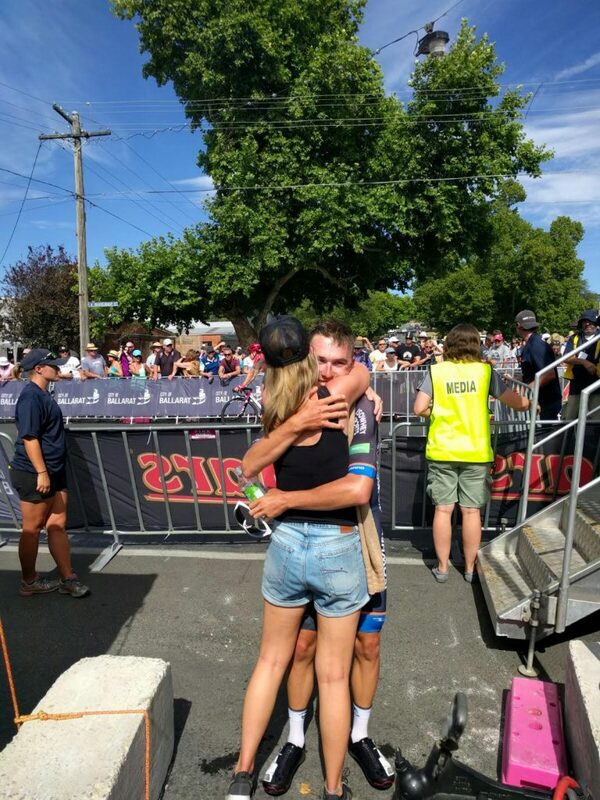 While he’s still tearing apart the local scene -with recent high profile wins for his new team, InForm Make, at the Tour of the South West (Stage One & Stage Two), and will no doubt have a strong showing at the upcoming Grafton to Inverell – Pat’s no longer chasing the professional cycling dream he once had. It was a decision he made recently, and a topic he provides detail on during this discussion with Lee. 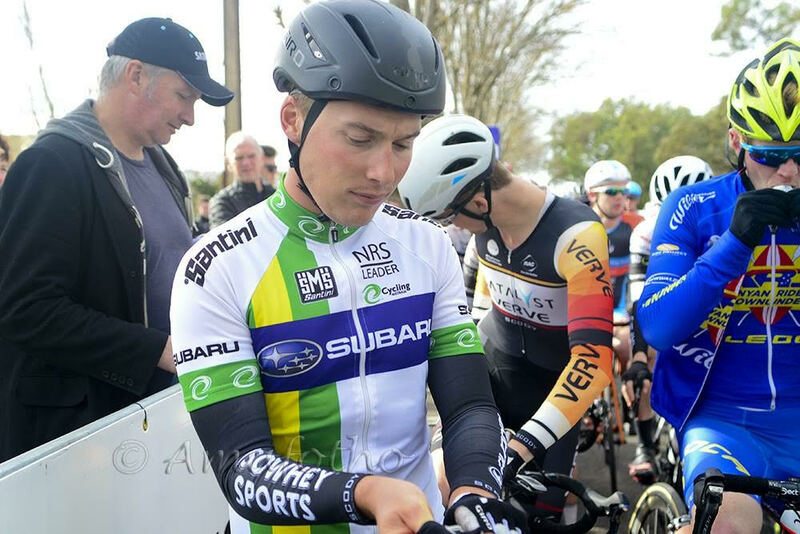 In addition, Pat describes his learnings from cycling’s semi-professional ranks, both here in Australia and overseas, as well as the sliding door scenarios that came into play. Sporting the leaders jersey for his previous team, IsoWhey. No doubt Pat will be sporting this jersey again with InForm Make. 2:15 mins: Show opening. Pat describes how he got into cycling and a high level overview of his career in cycling. 6:15 mins: Close to being professional. Lee asks Pat about being close to making it pro and what happened during those moments. 8:25 mins: What sort of rider is Pat Lane. Lee asks Pat about his riding style and what sort of rider he is. Included here is Pat’s win at the Grafton to Inverell a couple of years back. 11:5o mins: Pat’s move from IsoWhey to InForm Make. Lee asks Pat how tough the decision was and how he come to the conclusion to join InForm Make. 16:15 mins: Joining InForm Make. Lee asks Pat about his new role at InForm Make and riding with the team. How he’s enjoying it and what his role is. 17:45 mins: Training & preparation for the upcoming Grafton to Inverall. Lee asks Pat how he’s going with the training load and managing it in-between his new job at InForm. 21:15 mins: Performance enhancing drugs. Lee asks Pat if there was ever a temptation to get on the program. 25 mins: Pat’s 03rd at the Australian Nationals. Lee asks Pat about that podium and what it meant for him at that point in his career. 30:25 mins: Riding for IsoWhey. Lee asks Pat about the experiences of riding with Australia’s leading team under the direction of Andrew Christie-Johnston. 34:10 mins: The National Road Series today. Lee asks Pat about how he sees the highest level of racing in Australia today, the NRS. 35 mins: Pat’s plans for this year. Lee ask’s Pat what his personal goals and aspirations are for the 2018 cycling season. Pat also talks about the InForm Make team culture and his view of James Wheelan’s recent departure to Drapac. 39:20 mins: Preview for the Grafton to Inverell. Pat provides a quick preview for the upcoming National Road Series race. 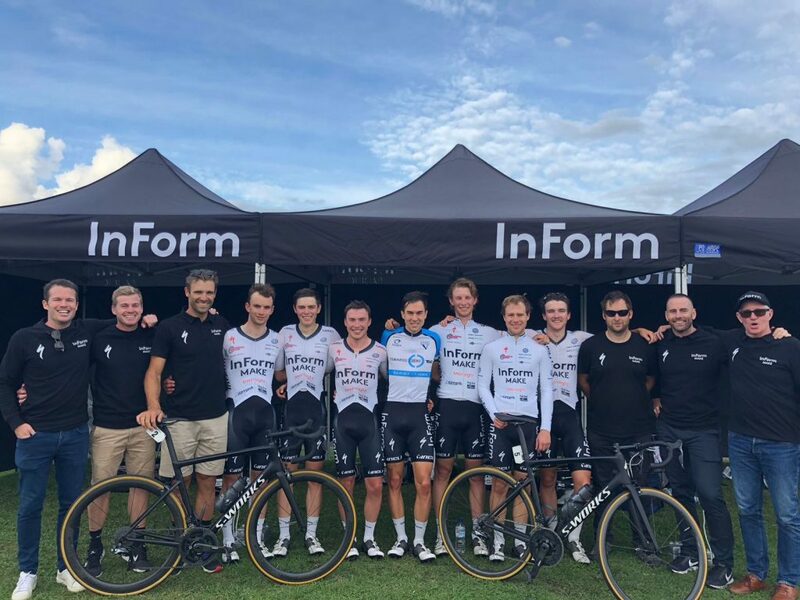 Pat pictured with team InForm Make at the recent Tour of the South West in Warrnambool. 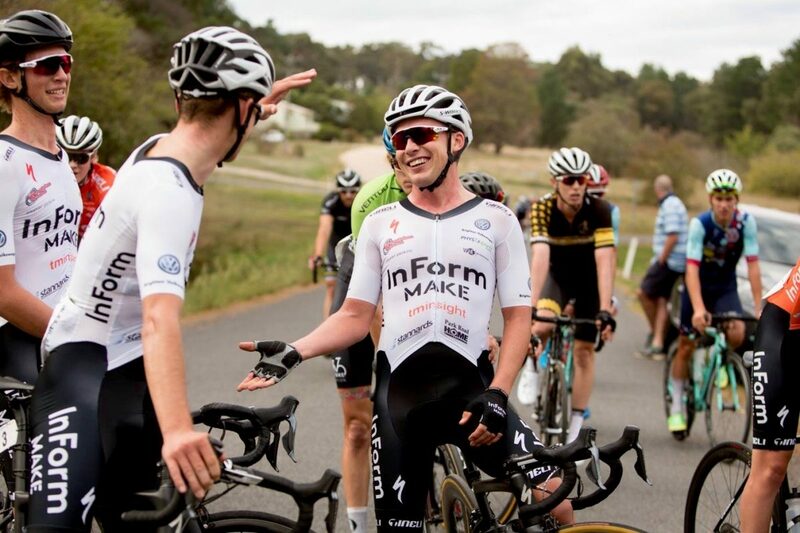 InForm Make are currently leading the teams classifications in the A Grade Victorian Road Series. 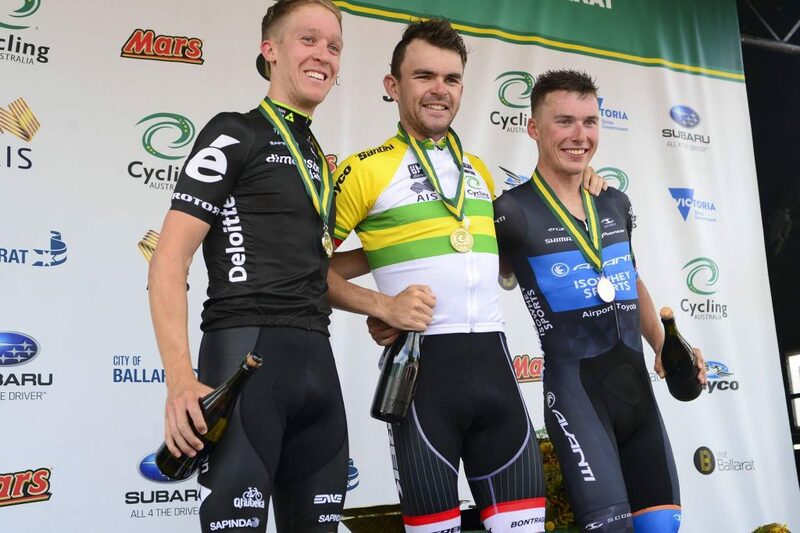 The 03rd at the Australian National Road titles in 2016 was certainly a highlight for Pat in his career so far. Although a win at a prestigious race during his time in Italy takes the cake for best moments. Pat is certainly grateful for the support he has received from family and his girlfriend (Jess Cummings pictured) over the years. 7.50 in first mention J.Hunt . ..😎 Good work Hollywood.